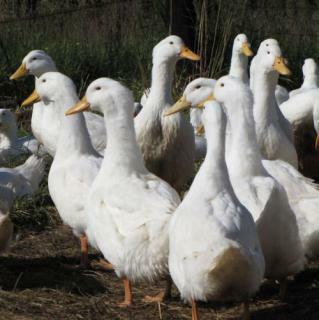 Since 2009, Dean and Serene de Chazal have been growing happy ducks on Shayile Farm in the Dargle, below Inhlosane. Dargle provides a perfect natural environment in wide open spaces and Dargle Ducks embrace this freedom. They are "open-range" ducks which means they are allowed to run freely and are fed with hormone-free, additive and preservative free feed. We are part of the "slow-food" movement which gives them a longer life. All the top restaurants in Durban and the Midlands buy their duck. In 2012, Dargle Duck won the Best Producer in the Paddock Category at the Eat IN DSTV awards. Wherever one looks, there is an abundance of vegetation – sunflowers, cabbages, amaranthus, wheat, broccoli, cauliflower, radishes, rye and beans. Earthworms are encouraged as well, as we all know ducks are not vegetarians. The bigger ducks have a pond to splash in on hot summer days, while the little ones are clearly quite satisfied with preening in the spray. Under the shelter, there is plenty of maize, soya and sunflower seeds dished up too. It’s a good walk from the sprinkler as they are encouraged to get plenty of exercise – across the bridges, through the ditches and around the landscaped berms, nibbling on the greenery as they go.